A native of western Pennsylvania, Bishop Edwin Bass is the eighth of ten children born to the late Bishop Joseph E. Bass, Sr. and the late Missionary Mary V. Bass. Along with Bishop Bass, his wife, daughter, maternal grandfather, father, mother, four brothers, one sister, three nephews and two nieces comprise a historical ministerial lineage with over 400 years of combined service in the Church of God in Christ. Bishop Bass is an alumnus of Colgate University in Hamilton, New York. Also, as a foreign exchange student, he attended Panjab University in Chandigarh, India. In the secular world, he served as Senior Vice President of Sales and Marketing for Blue Cross Blue Shield. As the visionary founder and pastor of The Empowered Church COGIC in St. Louis, Bishop Bass works with his Jurisdictional Prelate, Bishop R. J. Ward of the Eastern Missouri First Ecclesiastical Jurisdiction serving as Administrative Assistant. The Empowered Church is a beacon of hope within the Spanish Lake community of St. Louis, where this progressive ministry continues to grow and flourish. The Descending Dove Community Development Corporation provides programming and other resources to the community at large. Bishop Bass also serves the Church of God In Christ as: Chief Operating Officer, President, COGIC Urban Initiatives, White House Liaison, representative to the United Nations, Chairman of the Jubilee Broadcasting Network, Chairman of the Social Justice & Theology Council, member of the Presiding Bishop’s Executive Committee, member of the Senior Executive Planning Commission, member of the Presiding Bishop’s Voter Initiative Committee, member of the Quality Assurance Team, board member of the Mason Street Project and board member of the COGIC Community Development Corporation. He has been privileged to meet with President Barack Obama and Vice President Joe Biden on several occasions. On November 11, 2012 in the Edward Jones Dome in St. Louis, he was consecrated as a bishop within the Church of God In Christ. He was elected President of the 2012 Episcopal Class by his peers. Bishop Bass has enjoyed many historic first. Among them, he was the first African-American pledge of Lambda Chi Alpha Fraternity while an undergraduate student at Colgate University. As a result, the chapter at Colgate was expelled from the fraternity. He participated in the ’68 Sit-In at Colgate University that resulted in significant changes on the campus. Later he was the first African-American Director of Group Insurance Marketing with the Prudential Insurance Company. He also served as a consultant with the William Mercer Company. He went to become the first African-American vice president and subsequently senior vice president with Blue Cross Blue Shield of Missouri which is now known as Anthem Healthcare. With an enduring commitment to establishing community, Bishop Bass has served tirelessly on the boards of the United Way of Greater St. Louis, St. Louis Transitional Hope House, Lindenwood University, Grace Hill Economic Development Corporation, the Urban League of St. Louis, the U.S. Justice Department’s Operation Weed and Seed, the Christian Hospital Ethics Committee, Eagle Bank & Trust Company and the Colgate University Alumni Corporation. 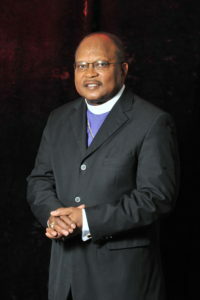 Among numerous honors and awards, Bishop Bass was featured in Speaking of People in Ebony Magazine. He is nationally known for coining the phrase, “I Won’t Be Silent Anymore!” and for authoring a book by that name. During the 2010 Holy Convocation, Bishop Bass was presented ‘The Presiding Bishop’s Medal’ for his work in COGIC Urban Initiatives. He has appeared on the O’Reilly Factor, CNN, MSNBC, the NBC Nightly News with Brian Williams, the BBC and media throughout the world. Additionally, he has been quoted in USA Today, the New York Times, the St. Louis Post Dispatch and the Huffington Post to name a few. The greatest asset to his professional and personal life is his beloved wife of 44 years, Lady Jessie Miller Bass. As young children, they had the prophetic experience of being saved in the same revival service. They are the blessed parents of Sean, Craig, and Courtney and proud grandparents of Kyng Cleveland, Paige Bass and Hannah Bass. They lost their eldest son, Sean Edwin, through a random and heinous act of violence. From the pain and scars of this family tragedy, Bishop and Lady Bass have emerged with tremendous insight and empathy into the hurts and wounds of others, and have thereby enlarged their capacity for ministry. Those who know Bishop Bass well can attest to his intellectual and leadership competencies, but they are more profoundly impressed by his deep sense of loyalty, integrity, humility and fervor for the things of God. Copyright © 2019 The Empowered Church.